Based on The Nightmare Before Christmas' villain Oogie Boogie, the Disneyland tradition is a six-feet tall creation of sweet ginger-dread. Tim Burton and The Haunted Mansion collide for this scary sweet gingerbread house at Disneyland. Houses made of cookie don't typically scream Halloween. In fact, they don't typically scream at all, typically filling out a cutesy Christmas tablescape. But at one of Disneyland's most haunted estates, scaring up a good time (especially around the holidays) comes with the territory, and nothing says "Season's Screamings!" quite like a creepy cookie creation. This year The Nightmare Before Christmas' buggy big baddie has been brought in to make sure one of the park's favorite Halloween Time tradition's lives up to the hype. After a 13-year absence, Oogie Boogie is once again serving as the focal point of the Haunted Mansion ballroom's annual gingerbread centerpiece. An animated, seven-foot version of the sack of bugs stands behind the six-foot-tall ginger-dread house. 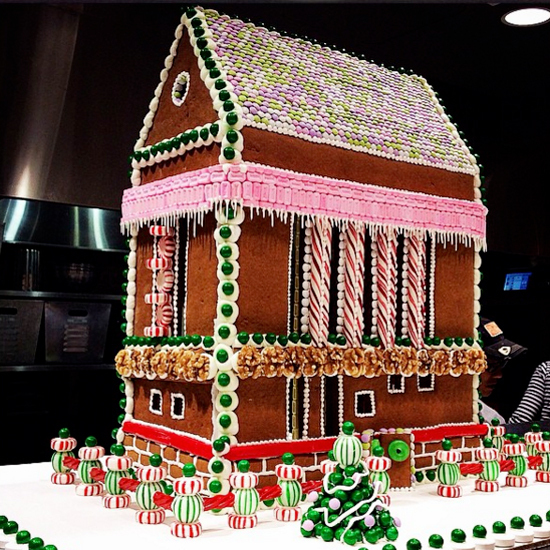 With the roof pried open and fork in hand, Boogie looks ready to address the table's "bug infestation," or the more than 70 gingerbread bugs scrambling and scurrying around both the ballroom and its table. According to Disneyland Resort executive pastry chef Jean-Marc Viallet and lead pastry chef Edgar Urtola, the rather impressive gingerbread creation took 200 hours to make and required 200 pounds of gingerbread, 200 pounds of powdered sugar, four gallons of egg whites, 50 pounds of fondant, and 30 pounds of white chocolate. 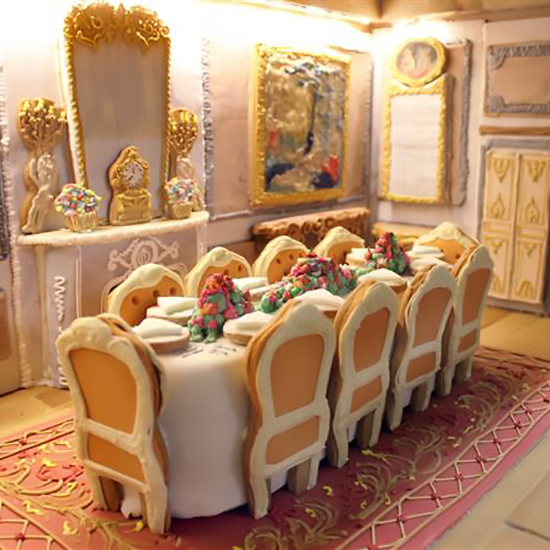 Last year the resort cobbled together a Sally-themed gingerbread mansion "from other different gingerbread houses and treats," according to Tim Wollweber, the associate art director for Disney Parks and gingerbread house designer. The gingerbread house is part of the annual Halloween Time festivities at the Disneyland Resort, which includes this temporary transformation of The Haunted Mansion tour ride by Tim Burton's classic stop-motion characters. This year's nightmare-ish makeover features jack o' lanterns and wreaths, terrifying toys and many of our favorite characters from Halloween Town. Beyond the mansion, there is a selection of fiendish and fun activities across the park including a haunting hootenanny, Main Street pumpkin festival, and "after-dark" versions of some of your favorite rides. Guests who've scared up a sweet tooth after viewing the gingerbread mansion can stop by the Jolly Holiday Bakery Café at Main Street for the Mickey-Shaped Mummy Macaron or grab the New Orleans Square's French Market Restaurant's Oogie Boogie dessert, "a dark chocolate cup filled with layers of dark chocolate mousse, green pound cake and chocolate cookie crumbles with gummy worms." Word has it the park also features a pumpkin churro. The gingerbread house and the rest of the Haunted Mansion Holiday tour ride opened last Friday, but it will run until January 2018. You can get your own cookie-inspired spookiness on at home with some of these fall-themed cookie cutters.